Jeremy Scott is set to launch his second collaboration with Adidas Originals. The collection will be released February 1st and will range in price from $120 to $250 for a pair. The shoes will be available in select boutiques and a month later at Adidas Original stores. I’m going crazy over the gold winged kicks, but they all look seriously hot. This week Paper Magazine has once again invaded Los Angeles. The festivities started last night at the Paper Magazine store front, which is located at 8873 Sunset Blvd. The opening party featured NYC Santo’s Party House taking over the retail space with a performance by Andrew W.K. and DJ Andrew Sweeney. The party continues tonight at Cinespace with the 2008 Levis Unreal Awards, which is a ceremony honoring reality show trainwrecks we have all grown to love. Friday and Saturday at the store front they will be having their 24-hour department store, which will house some of today’s hottest brands and designers, from Opening Ceremony to Jeremy Scott and many more. There will also be 24-hour musical performances from the following : Lady Tigra, Entrance, Daedelus, Imaad Wasif, The Chapin Sisters, Blackblack, Becky Stark of Lavendar Diamond and many more. Is there anything this girl can’t do? From modeling in Marc Jacobs ads to donating money to build a school in Africa, and, oh yeah, making two of the most critically acclaimed albums of the last few years. Lets hope the retirement rumors that were started at Bonnaroo and have yet to be denied are false. But it looks like the next release from M.I.A. will be a clothing line, which has been rumored for some time since when she’s not wearing Jeremy Scott onstage she is rocking her own designs. If you go to her site, there is a video that appears to be an advertisement for her clothing line with the tag line “coming soon.” The clothes look Bright, Bold and Brash, which is exactly what you would expect from M.I.A. According to the site, the line will have a limited run. And speaking of another critically-acclaimed artist getting into the designing world, get ready to rock your favorite electro stars Justice’s new line. 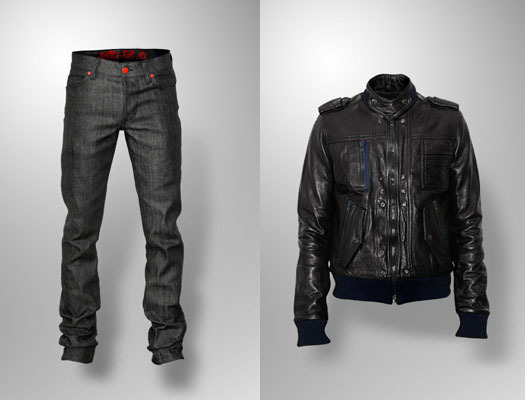 They have crafted leather jackets and jeans with Surface to Air, which can be purchased at select boutiques as well as on the Surface to Air site. But looking like your favorite French electro duo isn’t going to come cheap as the leather jackets will set you back a cool 800 euro’s. A Club Called Rhonda, which in only a few short months has become the definitive Thursday night hot spot for LA’s hipster fashionista set,� has now gone weekly. Booking DJs from Metro Area to Jeremy Scott, not to mention resident DJs Aaron Castle/Maxwell Smart and GODDOLLARS, and held at a Mexican bar, with interior that looks like something out of Scarface, this club’s dance floor turns into an anything-can-happen affair. This week features a live performance from Ryan Heffington’s music project We Are The World. Make sure to RSVP, or you will find yourself paying top dollar to enter the club. Early arrival is strongly suggested. Pictures from Rhonda are forthcoming. This was an amazing week for Threadtrend. The word is spreading, and lots of you signed up for subscriptions. We love it, and you will be rewarded because we have some exciting developments on the horizon. Stay tuned. Vintage Vogue and Sassy live on at Paper Pursuit. Claire Danes’ Shopgirl wardrobe makes her more palatable. It’s 1990 and your parents won’t buy you Dr. Martens, try Monkey Boots. Can’t afford Jeremy Scott? Buy the same sunglasses at a thriftstore. The new Marc Jacobs ads starring Posh debuted and are shockingly witty. We’re all up in the Teen Scene: Saleisha gets her cover and Teen Vogue goes all out for Spring. Dr. Martens vie for a place in our Spring wardrobes. Project Runway’s Christian acts human for once. It only took a prom dress. We know what’s hot and what’s not for men this Spring. Zip it! Check out his sophisticated zipper jewelry from Kate Cusack. M.I.A. has facial hair in the new Marc Jacobs ads. Viva La Revolucion! Spats: fun to say and your new perfect accessory. The sad tale of a lost Hermes scarf. Jennifer Connelly’s new Balenciaga ads are out. She’s wearing that dress heard ’round the world. Miss Bruno makes its way into our hearts with chic handmade scarves. Ladies and gentleman, meet the new karate shoe. Ellen Page wins us over with her spread in Los Angeles Times magazine.